Historian on the Edge: Why do we need the Barbarians? He was right; the bigger question, a hundred years on from Cavafy, is probably ‘a solution to what?’ As far as I can see, the problem which they solve cannot be ‘why did the Roman Empire fall?’ The barbarians’ role in any analysis of the Empire’s collapse must surely be sought under ‘consequences’ or ‘effects’ or – perhaps better – ‘components’, rather than under ‘causes’. If one looks at the matter in simple descriptive terms, the number of provinces or amount of territory actually conquered by barbarians during the fifth century is minimal. Note that the general move, in the colour scheme adopted in these maps [a reference to the PowerPoint Slides, I'm afraid, but they were simply the maps in Barbarian Migrations], is rarely from white to black, from Roman rule to barbarian rule, but from white to some shade of grey, either as a federate kingdom or as an area simply where the writ of the Ravennate court did not run. North Africa is probably the only example of a province conquered directly from the Empire by barbarians, their occupation being recognised by a Treaty in 442. Even then, however, quite what that ‘treaty’ implied is not very clear. The Vandals acquired control of Byzacena, Numidia and Procunsularis but what did that mean, exactly? I’m not sure we actually know. More important is Huneric’s betrothal to Eudocia, something which meant that, had they had any children by the time of Valentinian III’s death in 455, they would presumably have been regarded by many as legitimate heirs to the throne of the Empire. The Vandals regarded their links with the imperial house very seriously and, furthermore, Vandal raids on the West stopped after 442, precisely until the murder of Huneric’s father-in-law, Valentinian III in 455, when war broke out again. Geiseric wanted to place Huneric’s Roman brother-in-law Olybrius on the throne, restoring the Vandals’ legitimate Theodosian dynastic position at the heart of the Empire. This was finally achieved, and with it another treaty recognising their position at the heart of the Empire, in early 472. Only Olybrius’ inconsiderate death, some months later, plunged the Vandals back into the cold, where they, like all the other factional losers in fifth-century politics, settled for a kingdom. This serves as a very good example of fifth-century western politics, which cannot by any stretch of the imagination be characterised by struggles between defending Romans and invading Barbarians. Everywhere within the western Roman world, where we have any evidence, what we discern is the alliance between military and civilian élites, usually but far from entirely in the form of soldiers with barbarian identities and local provincial aristocrats, forming factions competing for power within the political structures established in the fourth century. Fifth-century history is one of repeated failures by various factions to consolidate a position at the heart of the Empire by re-establishing direct control over all the other regions and their factions. Such failures were by no means predestined: sixth-century history shows how dramatic the results of a single significant military success could be. Even as late as 471 it was far from impossible that the situation could be restored. However, successes were indecisive, and failure usually led merely to a retreat into de facto autonomy in the region where one’s power base was located and frequently the assumption of the title of king: a pattern repeated over and over. This point matters. It suggests that the grand narrative of the attempts by barbarians to conquer lands and create independent kingdoms within the Empire is, fundamentally, empirically mistaken. I cannot find any support for the idea that kingship was the preferred aim of any ‘barbarian’ leader in the fifth century – and let’s remember that most of the so-called barbarian leaders of the fifth century were actually born and raised within Roman territory. But that grand narrative, of barbarian invasion, conquest and kingdom-creation, is hugely problematic. I have taught a Masters’ Degree course called ‘Renegotiating Rome’ in which we look serially at different forms of data from the fifth century – settlements, burials, annalistic sources, literature, art – and compare the story those forms of evidence tell with the grand narratives of modern histories. What we have found (to an extent that I was quite unprepared for) is not merely that those narratives barely resemble modern reconstructions, but how another set of stories emerges. One is how little fifth-century contemporaries were actually interested in the barbarians – except in long-established rhetorical ways. The other - which makes a bigger problem for my own book on this period than it does for its competitors – is that the real fifth-century grand narrative concerns a shift in the way the world was divided up: from a system within which the ideal Roman male occupied the central position, with other identities – barbarian, female, animal – defined by their closeness to or distance from this single pole of attraction, to one in which the centre being competed for was defined by religious orthodoxy. Others were categorised by their distance from this. This is not incommensurate with the narrative of the break-up of the western Empire; it is crucial to that break-up. Nor is it incompatible with the fracturing of political identity into a series of identities based largely, though far from exclusively, around different barbarian ethnicities. But it does suggest that seeing the fifth-century in these terms is well wide of the mark. Why, then, are people so wedded to the barbarians as the major cause for any and all change in the late antique west? For they are. 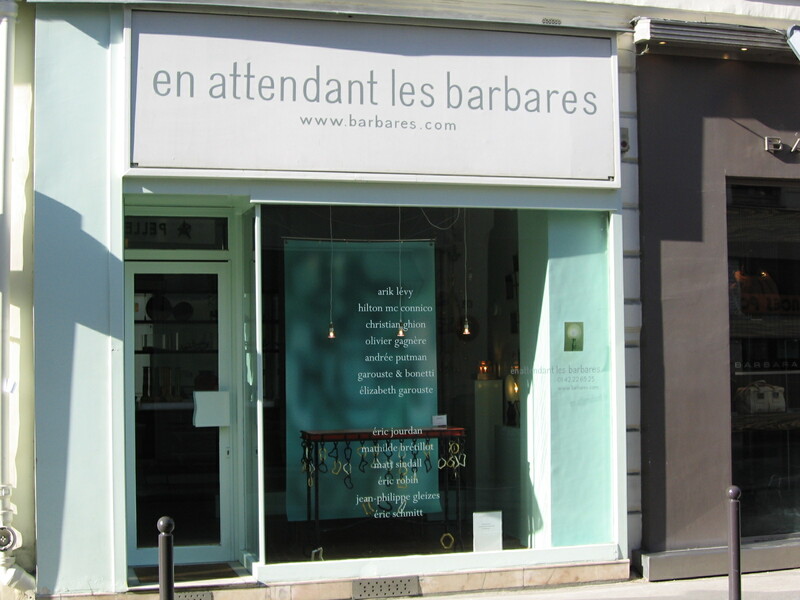 Here is a, in a way quite minor, but nevertheless rather good, example that I came across in Paris a couple of weeks ago, of how anything and everything can be pinned on the barbarians, whether in terms of presence or absence. It comes from an article about antler-working in the towns of the Meuse Valley which, for those not in the know, is not conventionally regarded as in The Germanic World. “The Meuse valley sites, presenting continuous occupation from the Roman period into the Merovingian, show that the working of antler found its roots in the Germanic world.” The author then moves on to explain that this is because early Romans didn’t use antler very much but late Romans did, and the late Roman period was when the Germanic ‘tribes’ (the word used) were settled in northern Gaul. He then discusses why antler is actually a better material than bone for making combs… Why Romans can’t just change to using a better material, within the Roman period after all, is left unexplained. Historians are not immune from similarly bizarre reasoning, of course. The counter-revisionist offensive against more subtle ways of thinking about the fifth century has been led by British historians from Oxford. Peter Heather has repeatedly deployed the notion that, because wagons, women and children are occasionally mentioned in sources concerning the barbarians, the barbarians must have been ‘peoples’ on the move. 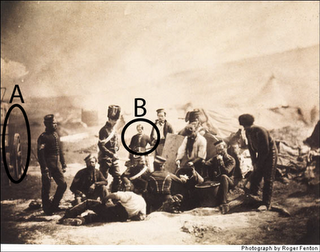 Here (right) is Roger Fenton’s photograph of the cook-house of the 8th Hussars in the Crimea, probably in 1855. The British expedition to the Crimea is surely, uncontroversially, the movement of an army rather than a migration of people, in spite of the clearly documented presence here of A: a wagon, and B: a woman. Actually you can stay in the Roman period and find more than enough references to wagons, women and children in accounts of the Roman army. Such are the weakness and double-standards of the arguments in favour of the traditional narrative. You can list many more. To this one can add the logical knots that traditionalist archaeologists tie themselves in, to maintain that things like furnished inhumation, for which there is no prima facie evidence to support a ‘Germanic’ origin, is the sign of barbarian settlement. Or the arguments in favour of the Grubenhaus being a similar index. The Grubenhaus is now known from all over western Europe within and without the Roman Empire’s frontiers, in particular in North-Western Germany, northern France and in England. It is known in northern Gaul from the third century but only from the fifth on the coastal sites of the Anglo-Saxon homelands and in England. To make this a Germanic cultural artefact requires us to assume that two different Germanic groups with significantly different archaeology in their homelands moved to different parts of the Roman Empire, where they suddenly started producing settlements that were remarkably similar. In any other period, even in the early middle ages, the hypothesis would be that the ‘grub-hut’ was part of a common response to similar social economic crises in different areas of north-western Europe, with influences as likely coming from the Empire to barbaricum (indeed perhaps more likely in that direction given the overwhelming direction of cultural influences documented in that period) as in the opposite direction, from barbarian territory to Roman. Yet here we are supposed to see people’s ethnic identity, related to their geographical origins, as simply manifested in these buildings, even to the extent that minor details of planning of SFBs are alluded to, to prove their ‘Anglo-Saxon’ credentials. Influence can’t move from the Empire to barbaricum (even though it demonstrably did!) because the barbarians didn’t move in that direction. Thus far, I hope, I have shown that the barbarian invasions grand-narrative is, when moving from simple description to explanation, empirically dubious but that, inaccurate and misleading and mired in questionable preconceptions though it is, large numbers of archaeologists and historians continue to cling to it, to the extent of deploying some of the most absurd arguments to justify it. Why? One reason is without doubt the weakness of the alternatives and responses to it. Some have moved perilously close to denying that migrations ever took place. A French amateur archaeologist called Alain Simmer indeed has said outright that there was no Germanic migration into Lorraine. One reason why the traditional narrative remains ensconced as firmly as it is is that these arguments have, if anything, frequently been at least as absurd as those in favour of the old style Völkerwanderung. Another is that most minimalist arguments do not, in fact, challenge the master narrative. The barbarians still conquered the various territories of the Empire and thus brought down the imperial state; there just weren’t as many of them – they were a military élite. Sometimes this is descriptively a better reading, but it doesn’t change the story except in its details and, because of that, the explanation can become less satisfactory. The ‘late antique problematic’ has a curiously schitzophrenic attitude to barbarians. For the last forty years or so, it has promoted – rightly on the whole – a view which sees the development of the Roman world (however defined) within the framework of specifically later Roman features, moving away from a sharp break in the fifth century. Longer-term trajectories are preferred, and the inheritance of Rome stressed. And yet, when it comes to the western Empire’s demise, the late antique paradigm has evidently developed no alternative to seeing the West beaten down by waves of barbarians whom it couldn’t keep out. Partly, I am sure, this stems from the largely Mediterranean – eastern Mediterranean – focus of late antiquity studies, and from their concentration on cultural and religious history. This ought to be an irony given what I said about the essentially religious master-narrative that our fifth-century sources actually tell. The last alternative is the ‘Rome never fell’ approach, now sadly more or less whole-heartedly subscribed to by Walter Goffart. This approach does not deny that there were barbarian migrations; it just denies them any significant role in history: utterly irrelevant features of a process which didn’t actually happen anyway! Thus we have a situation where, in many people’s minds the choices before us are evidently, either, that nothing happened, or, that there was a huge catastrophe caused entirely by invading barbarians. This is still rhetorically presented as the only interpretative choice available to us by those supporting the traditional narrative but this is far from really being the case. Plenty of people other than me – most famously, Walter Pohl – have written about serious, dramatic change happening in the fifth century without blaming it on the barbarians and without denying that there were migrations in the fifth century. Yet this – if I dare call it such – third way seems nevertheless to be very much a minority position. But I am not convinced that a simple lack of exposure to sensible alternatives really explains the continuing, fanatical devotion to the idea of the barbarian migrations, especially outside the academy. Outside academic circles, it is certainly the case that the adhesion to the idea of barbarian invasion has a heavily right-wing political dimension. Apart from the barbarians’ role as metaphor, already discussed, it is worth, very briefly, thinking about the other reasons why people are so ready to pin the blame on the barbarians. Slavoj Žižek’s Lacanian analysis of antisemitism provides some valuable ways forward. Essentially, the barbarian, like the figure of the Jew, acts as a screen between the subject and a confrontation with the Real, which Žižek sees, slightly differently from Lacan, as the pre-symbolised; things that haven’t been or can’t or won’t be encompassed in a world view. Žižek showed that arguments that ‘the Jews aren’t like that’ are almost never effective against anti-Semites because what real Jews (or actual immigrants, one might say) are like is not the point. Similarly, arguments about the empirical reality of the fifth-century cut little weight with those wedded to the idea of Barbarian Invasion. Just as the anti-Semite takes factual evidence as more proof of the existence of the international Zionist conspiracy, the right-wing devotee of the Barbarian Invasions sees factual counter-arguments as manifestations of the liberal, left-wing academy peddling its dangerous multicultural political correctness. I have read a great deal of this on internet discussion lists – including a review of my own book, and one of James O’Donnell’s! Michael Kulikowski received a similarly-phrased review from a right-wing academic ancient historian. The barbarian is the classic ‘subject presumed to’. The barbarian can change the world; he can bring down empires; he can create kingdoms. The barbarian dominates history. ‘He’ is not like ‘us’, enmeshed in our laws, our little lives and petty responsibilities. The barbarians in the vision of Peter Heather, are peoples with ‘coherent aims', which they set out single-mindedly to achieve. No people in the whole of recorded human history have ever had single coherent sets of aims. Well – none other than the barbarians anyway. What do we get if we lift the veil of the barbarian? We are presented with a picture of a world where things were much messier, where the barbarians did not occupy a separate world, which existed in binary, frequently hostile, opposition to the Empire. Where a dominant culture has a responsibility to those it dominates within its world and where it becomes responsible for stress in that other part of the world which it dominates, including stress that results, unsurprisingly in migration towards and into the dominant civilisation’s territory. Move the barbarian ‘subject presumed to’ and we have to face up to the historical reality of destructive stress caused by social inequalities, by self-serving rivalry amongst the political élite, rivalry – at base - to control more of the material and cultural fruits of the surplus generated by the empire. It is a picture where history unfolds as ‘contingency, singularity [and] risk’, to take a phrase from Roland Barthes – events occurring in chaotic constellation and kaleidoscopic sequence. This is not a comforting vision. Far better to hang the veil of the barbarian, the subject presumed to evade all the normal rules of history, between us and it. If the figure of the barbarian ruins everything no one can be blamed for that; no one can control the barbarian. If we, as late antique historians and archaeologists wish to do something more than inhabit an airless ivory tower, if we want to take our responsibilities to society seriously, then the most important duty facing us today is to rip that veil away.